Bebe Cool On BBA Stage! 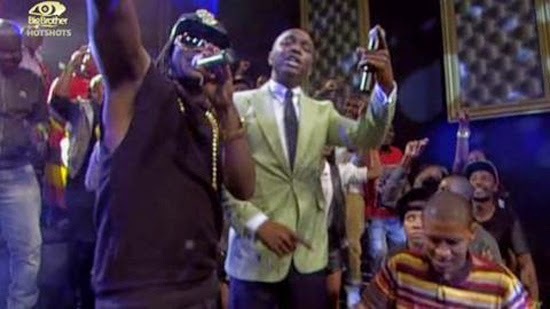 Tonight marked the penultimate and 8th eviction of the season and who better than Ugandan dancehall and hip hop sensation Bebe Cool to usher us into the proverbial end days? The multilingual musician has, in the past, docked nominations for the historic Kora All African awards and often lends his voice and platform as an artist to various socio-economic causes in Africa. He launched onto stage with his hit single "Love You Everyday" and had the crowd eating out of his hands. The rambunctious and mischievous beat to his music was sure to get this party started. Sadly, however, this party was going to be a bitter sweet one as there were more housemates headed down the eviction gallows tonight. IK sashayed onto stage a cool and charming sight in a bespoke Mai Atafo penguin suit fit with a pastel and mint green edge. Never one to disappoint he was the host with the most as he rang in the unfortunate bunch who are up for eviction this eve. Botswana’s belles Goitse and Sheillah were both up and towards the end the fellow country mates became one another's competition as each had to fight for their country's vote. But that is just the name of the game. Mozambique's son of rap Trezagah and Miss Uganda Ellah found themselves in the pile by default with Trezagah earning himself a nomination during his infamous freeze task breech and Ellah being the hapless "added" housemates once again. Buddies JJ and Idris were also up with each representing Zimbabwe and Tanzania respectively. And lastly the feisty Malawian lass with a baritone Sipe was also on the list. One of these housemates were going to be handed their marching order in only moments. The question was who was it going to be? IK also shared news about the ONE Campaign which is an international advocacy organisation made up of more than six million people taking action to end extreme poverty and preventable disease, mainly in Africa. Representatives from the campaign were invited into the house this week to educate housemates and introduced them to their cause. I just love the BebebCool new song! Soo good! Wish him the best in whatever! Waw... Was very happy to see our Bebe cool perform well done. U have always made us Ugandans proud.